This sisig is the fish version of your favorite pork sisig. It is made from fresh tuna fillet cubes and marinated with liquid seasoning then fried until crispy. But you also fry them until brown if you want it meaty and still have some juices in it. I think you can also use canned tuna chunks but the taste is not as good as the fresh tuna. If you are abstaining from pork, this is a good version of sisig to try. Try it and you’ll love it! 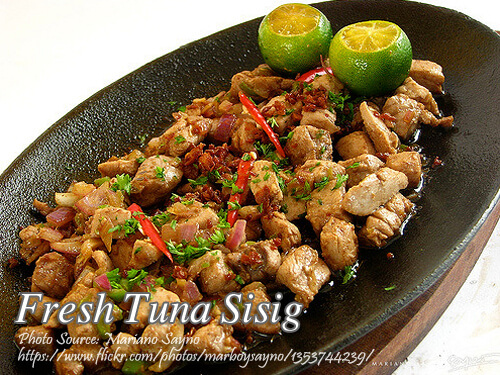 To cook fresh tuna sisig; Marinate tuna in liquid seasoning with calamansi for at least 15 minutes. Fry marinated tuna until brown and crispy. Set aside. Heat oil and saute onions for 30 seconds. Stir in prepared tuna and season with granulated seasoning and liquid seasoning. Transfer on a heated and buttered sizzling plate. Top with crushed chicharon if desired. This sisig is the fish version of your favorite pork sisig. It is made from fresh tuna fillet cubes and marinated with liquid seasoning then fried until crispy. Marinate tuna in liquid seasoning with calamansi for at least 15 minutes. Heat oil and saute onions for 30 seconds. Stir in prepared tuna and season with granulated seasoning and liquid seasoning. Transfer on a heated and buttered sizzling plate. Top with crushed chicharon if desired. Love your tuna sisig. Very simple and easy to cook! Thanks! Hi Bitoy! You are welcome!